"The ornamental features that may now seem little more than decorative embellishments once acted as richly nuanced symbols, analogies, and coded commentaries. 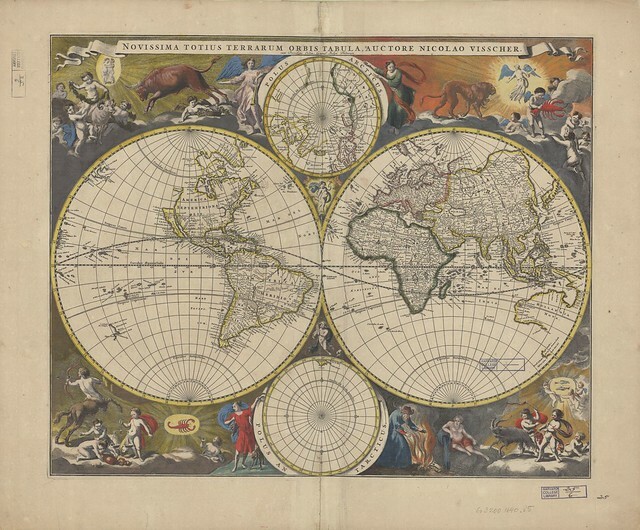 This exhibit explores how decorative cartographic devices - cartouches, vignettes, figural borders, title pages, and frontispieces—could provide narrative underpinnings for the geospatial content of maps." Note: the captions below are excerpted and you will find more information by visiting the exhibition site. Also, the names immediately below the images are the map publishers. 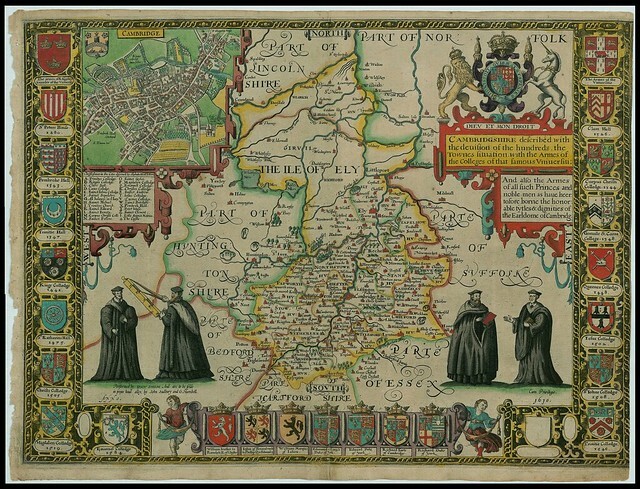 The instruments at the top of the sheet provide reassurance about the accuracy of the cartographic content." The cultural uniqueness of Japan is emphasized by the Sino-Japanese characters identifying the provinces, the noble crests (including the triple hollyhock flowers of the Tokugawa clan), and the images of the samurai, palanquin, and pagoda." 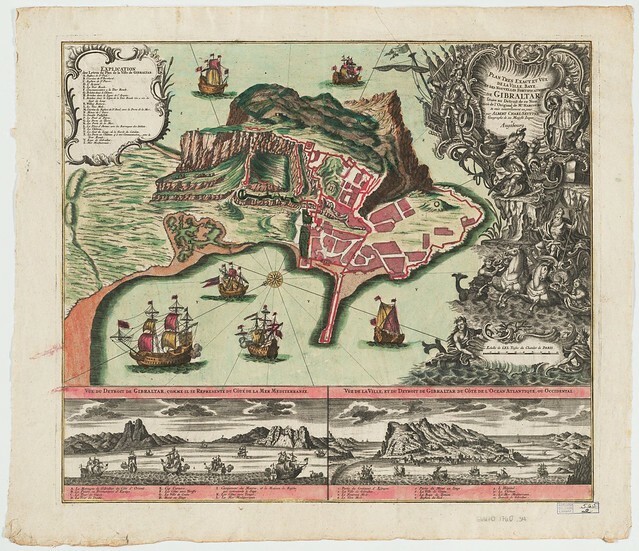 "In the seventeenth century, the Netherlands was actively engaged in exploration, colonization, and trade throughout all regions of the globe, and Dutch publishers were busy keeping up with a growing internal demand for travel accounts, illustrations, and maps. 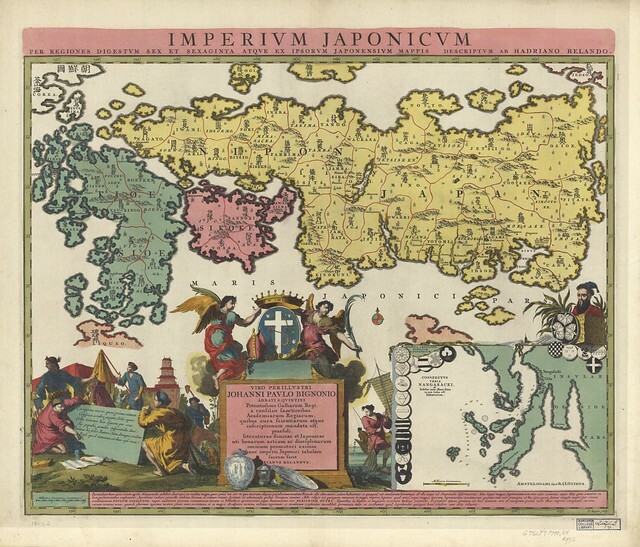 This map of Japan, published for the first time in 1715, shows one of Holland's newest commercial partners." The cartouche represents a graphic apotheosis of Tsar Peter, whose portrait is surrounded by allegorical figures representing a broad range of the arts and sciences promoted during his reign - including geography, astronomy, history, mathematics, navigation, poetry, geometry, and engineering." 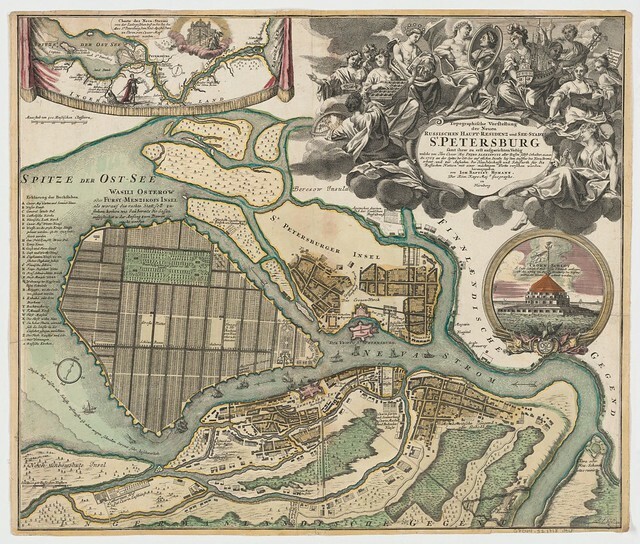 "This is one of the first published maps of St. Petersburg. The hexagonal Peter-Paul fortress is depicted at the center; the similarly fortified Admiralty is across and downriver from it. Vasilevskii Island (left), only just being settled at the time, shows the plan for its “regular” development drawn up for Peter the Great by the Swiss-Italian Domenico Trezzini (ca. 1670–1734), the first architect of St. Petersburg." The two figures at the intersection of the hemispheres represent the triumph of Christianity over pagan idolatry." "[T]he views and figures are primarily drawn from Theodore de Bry’s illustrations in his collections of travel accounts. 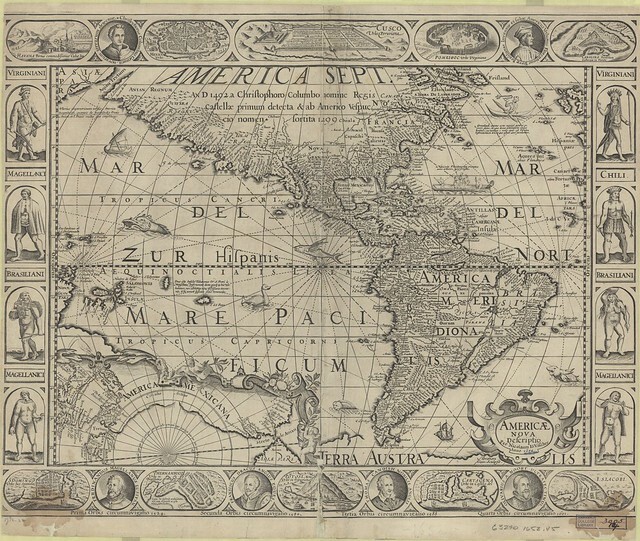 De Bry himself never set foot in the Americas, but he had access to numerous accounts by European travelers and explorers, including those acknowledged on the borders of the map: Christopher Columbus, Amerigo Vespucci, and four circumnavigators (Ferdinand Magellan, Francis Drake, Thomas Cavendish, and Olivier van Noort)." 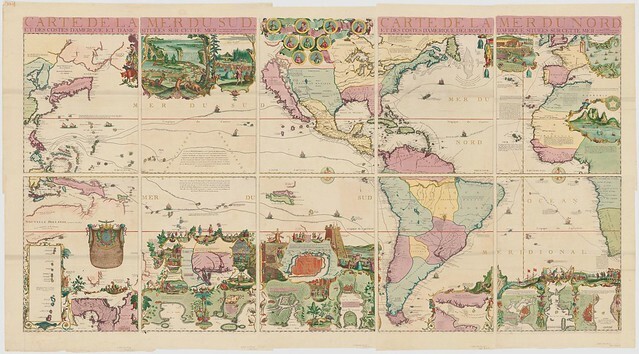 "De Fer’s map of the Americas offers an iconographic feast of imagery for those trying to grasp the implications of European colonial intrusion into societies whose “otherness” was their most defining feature. The map seems to suggest both economic opportunities (resources to exploit) and cultural clashes (among peoples whose customs, rites, and mores were so vastly different). The decorative vignettes are adapted from illustrations in various accounts of the first European encounters in the New World." "Spain formally recognized British rule of Gibraltar in the Treaty of Utrecht (1713) but, throughout the 18th century, periodically sought to reassert its territorial claims. The cartouche presents a graphic argument for an end to hostilities by featuring Mercury with his caduceus (the staff of entwined serpents, which symbolized commerce) and a cornucopia (horn of plenty). Whatever is decided by the human arbiters of destiny, the sea (Neptune) will continue to determine the fate of ships sailing through the Pillars of Hercules." 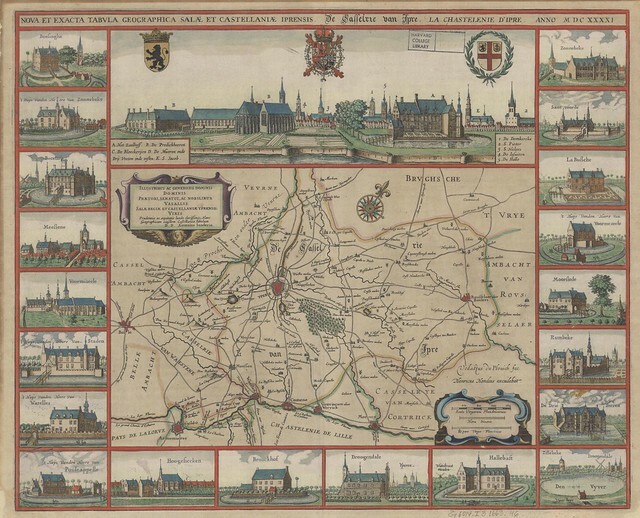 This map of Ieper (Ypres) [..] celebrate[s] the rich architectural heritage of Flanders." 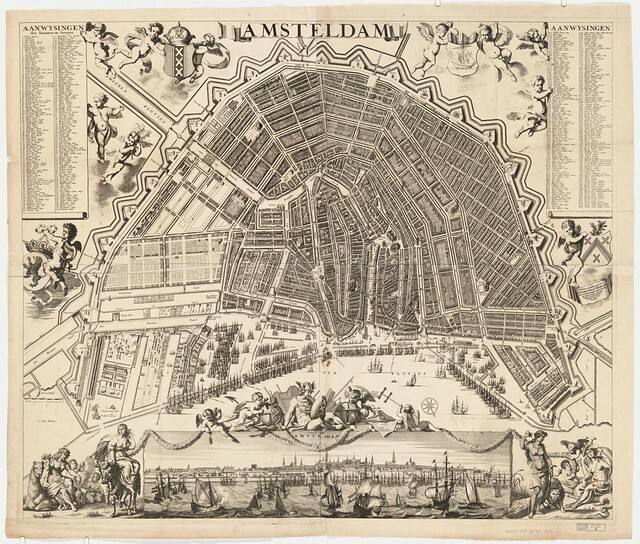 [F]or the ornamental features, [Speed] employed stylistic features that he particularly admired in Dutch mapmakers (including Jodocus Hondius, who engraved the plates)." "Cambridgshire deſcribed with the deviſion of the hundreds, the Townes ſituation, with the Armes of the Colleges of that famous Vniuerſiti. And alſo the Armes of all ſuch Princes and noble men as haue heertofore borne the honorable tytles & dignities of the Earldome of Cambridg." The vignette of the busy harbor illustrates a city hosting sailing ships from every corner of the world. Accompanied by putti engaged with a plumb line, nautical charts, globe, compass, cross staff, and anchor, Mercury (instantly recognizable by his winged helmet and caduceus) symbolizes the commerce, efficiency, and spirit of adventure that made the Netherlands such a formidable maritime power." The narrative panels conclude with the giving of thanks after the Ark settled atop Mount Ararat (prominently featured on the map southwest of the Black Sea)." 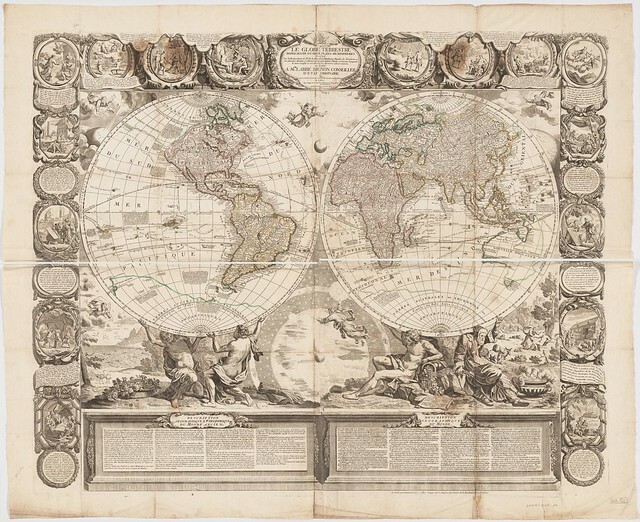 'Going for Baroque - The Iconography of the Ornamental Map' at Harvard College Library. Some very basic map ornament terminology. IN: 'Art and Cartography: Six Historical Essays' 1987, edited by David Woodward. I raise you one "going for Baroque" and give you one "carte diem." Otherwise, the "America Novo Descriptico" fascinates me. Wow! They don't make 'em like this any more. Can you imagine going on mapquest and finding this?!?!? Come to think of it, that would be great! Thanks so much for putting together this post, as an artist I draw a ton of inspiration from the language of maps and this was a goldmine of information! I received this wonderful book recently, called Cities of the World. It features many many maps like this. This post inspires me to scan some images from the book. 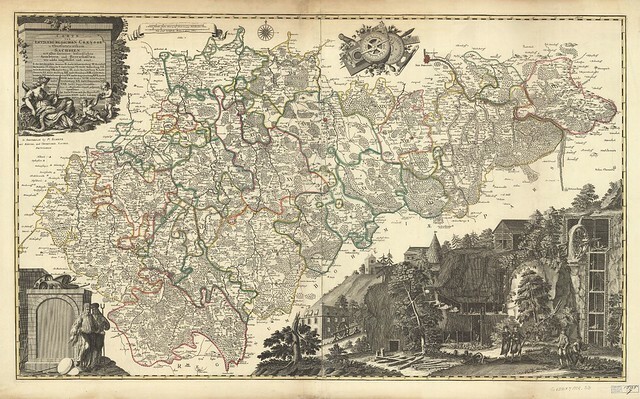 I have a soft spot in my heart for old maps and such.